ALEXANDRIA, Ind. -- It's a big night for county music duo Joey and Rory Feek. On Sunday, the couple celebrated most likely their last Valentine's Day together, and Monday night they will watch the Grammys together, too, reported CBS affiliate WTTV. The artists' version of the song "If I Needed You" is nominated for a Grammy award for the "Best Country Duo/Group Performance." The news of the nomination came just a few months after the pair revealed Joey's cancer is terminal and they stopped treatment. Joey, 40, was diagnosed with cervical cancer in 2014, just months after giving birth to the couple's daughter, Indiana, who was born with Down syndrome. Joey made it her goal to live to see the ceremony, WTTV reported. Unfortunately, she is not well enough to travel to Los Angeles for the show. 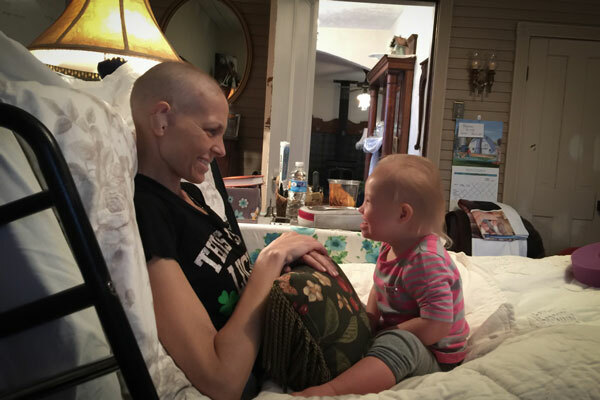 According to the couples' blog "This Life I Live," Joey bought Rory a plane ticket to Los Angeles, but Rory is refusing to leave his wife behind. "Joey tried to talk me into going with them... many, many times. She even had a Southwest ticket purchased for me that I cancelled. I can't leave her. I won't. I have done many foolish things and made lots of mistakes in my life, but this isn't going to be one of them," he wrote. "Instead, I will be sitting beside her and cheering on Little Big Town, and Blake Shelton and Charles and all the talented folks who are nominated in our category and others. It's an honor for us to just be a part of that night, it truly is." WWTV reported that the couple will watch the show with Joey's mother, father, her three sisters, and their kids gathered around Joey's bed. The 58th Annual Grammy Awards will air on CBS at 8 p.m. ET on Monday night.